She is moored in San Rafael Yacht harbor (off San Francisco Bay) i have not been able to attend to her myself, so i have been paying the previous owner to keep a watch on her for me. 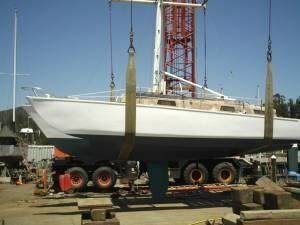 This of course means the sale must be conducted in the same manner that i purchased her,,OVER THE Internet and telephone with only the descriptions given me by the previous owner,along with photographs of the boat. 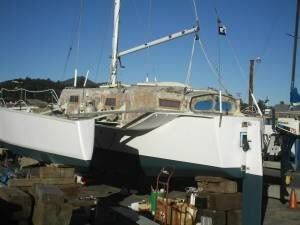 Interested parties may contact me via the interweb or by telephone, i will be as helpful as i can, and of course within limitations, as set by the harbor master at San Rafael Yacht Harbor Mr, Matt Butler interested parties are welcome to go look see for themselves. This sale will be conducted on a AS Is ..Where is....basis, as i have no way of taking interested parties out for sea trials. Tamara has been coated with epoxy undercoating on her upper structures, she has a full complement of sails,,she also comes with an outboard long leg motor, and may come with an inflatable dinghy. For this reason i am willing to entertain Low Ball offers,,,however,,,as i have stated quite a few time before in previous posts,,i will not react well to insulting chicken scratch offers,,so please conduct yourself wisely. Sorry to read of your woes. 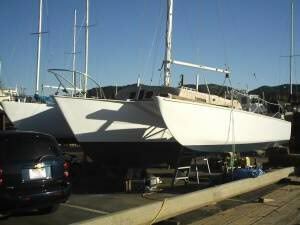 I believe a perspective buyer would like to know who owns the boat and by what means, title, bill of sale, registration? Selling over the phone/internet will take some serious negotiating skills, maybe a broker would help make the process easier--but at a cost. I wish you the best of luck and would love to see you able to keep her. I forgot to mention that she is currently afloat in the Yacht harbor,as these photo's where taken when she was on the dry prior to her re-entry. The boat has not been de-registered as of yet, i hold the signed transferred copy of the USCG registration along with my bill of sale and of course my receipt for monies paid. I would love to keep her, as this was my dream,my plan for the future, i just cannot see any other way through at the moment. Nemo, I just have a question for you. If this boat is a U.S.Documented Vessel, wouldn't the previous owner have to receive permission from the U.S. Coast Guard and the State Dept. of the U.S. for it to be sold to a non U.S. citizen? Now I believe he could take it out of U.S. Documentation and register it in the state of California and you would be ok. From what I recall of U.S.Documentation, the vessel actually becomes a piece of the U.S. Goverment, hence the reason you document before going overseas to be able to have an U.S. Embassy intercede on your behalf if need be. Have you made sure it is sellable from your standpoint? Good point Wiz, looks like we both (the previous) and me missed that one. Nemo, I just have a question for you. If this boat is a U.S.Documented Vessel, wouldn't the previous owner have to receive permission from the U.S. Coast Guard and the State Dept. of the U.S. for it to be sold to a non U.S. citizen? 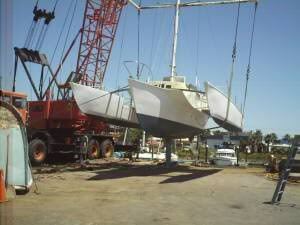 I believe the owner can cancel his documentation as per coast guard Q&A: HOW DO I DELETE A VESSEL FROM DOCUMENTATION? Sorry for stating the obvious, but how does one know this is not a scam? THERE ARE BARNACLES GROWING ON YOUR BOTTOM! I quite understand your concern, as i was when i bought the boat long distance, based only on telephone calls to the previous owner,, and pictures sent to me along with copies of registration. I really wanted a SeaRunner, so i was willing to take a risk. I can only do right by the next guy by trying my best,,,as such it is killing me to sell the boat in the first place,,and if i can find a way to get to her,(visas etc),i will cancel the For Sale post immediately. Other than that,,deposits and due diligence are the rules of the day. I'm certain this is a honest transaction, BUT I would recommend a full inspection by some VERY experienced with these boats. +1 to the inspection,and USCG supplies the documentation info for free, but i guess Zedde is afraid to do due diligence.